A woman who was ticketed for having an obscene anti-President George W. Bush bumper sticker filed a lawsuit in federal court Monday against a county in the state of Georgia and its officials. Denise Grier, 47, of Athens, Georgia, got a $100 ticket in March after a police officer in DeKalb County, which is in the suburbs of Atlanta, spotted the bumper sticker, which read "I'm Tired Of All The BUSH--." Although a DeKalb judge threw out the ticket in April because the state's lewd bumper sticker law that formed the basis for the ticket was ruled unconstitutional in 1990, Grier is seeking damages for "emotional distress" against the county, according to the lawsuit. Grier also seeks a declaration in federal court that her bumper sticker is considered protected speech under the constitutional right to free speech because she is "uncertain and insecure regarding her right to display her bumper sticker in DeKalb County," the lawsuit said. The lawsuit was filed by the American Civil Liberties Union of Georgia. "This type of sarcasm in relation to political figures is as old as the country," said her attorney, Frank Derrickson. "We think this bumper sticker is just the latest example of this. We want to be assured that not just Ms. Grier but anyone who wants to have fun with the powers that be should be able to do that under the First Amendment." DeKalb County spokeswoman Kristie Swink said she could not comment on pending litigation. Grier, a nurse who works at Emory University and other hospitals, also is seeking punitive damages against the DeKalb police officer who gave her the ticket because he "acted with reckless disregard" of her rights, the lawsuit said. The state law prohibited lewd or profane stickers and decals on vehicles. 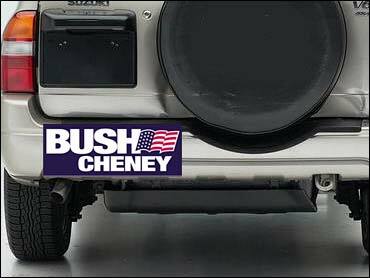 Derrickson said Grier still has the anti-Bush bumper sticker on her car. "I think she's got better ones than that, at least the ones that I saw," he said.